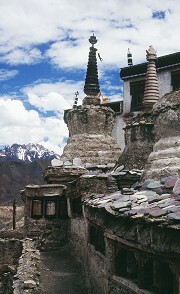 As part of a five year lasting research project in the 1994 and 1995 Lamayuru monastery was surveyed. 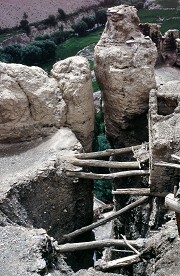 It is located a day trip away approximately southwest from Leh. Solitary-like situated on a table-hill in the centre of a big valley whose broad and fruitful bottom is almost flat. The monastery appears from the distance huge and massive but in real some tiny galleries surrounding a 15m tall rock-needle which encloses the meditation cave of its founder. Its access is by passing the monastery’s library, only. According to this there exist no rooms or vault-cellars without daylight. 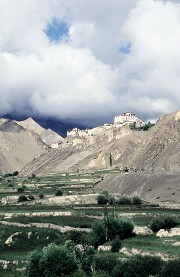 The monastery is surrounded by a secular village economical addicted to it. It is said being 15 monks should live in it. The measurement-campaign lasted three month in 1995. 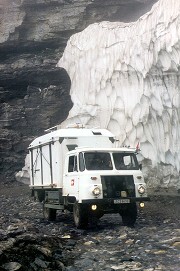 It included a overland transfer of the institute’s research truck from Aachen to India.